Sub-titled ‘an unconventional handbook’ this was written not by the Charles Dickens, but by his son, C. Dickens junior, who lacked both his father’s talent and business sense and ended up having to be found work as sub-editor of the All the Year Round magazine, which he eventually inherited on Dickens senior’s death. 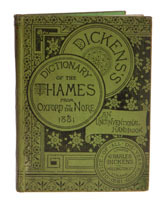 The boy is best remembered for his Dictionary of London and this book, the pair of which were reprinted every year until 1896 - there was also a Dictionary of Paris. If you imagine a Victorian ‘rough guide’ in dictionary form, you have got the idea and although little of this book is about fishing, it covers all the major species found in the Thames and has some useful background on fishing related items, like pollution and angling clubs. Not only are the original editions fairly cheap, but the Dictionary has been regularly reprinted, including a 1994 soft cover version. The author of most of the text was Greville Fennell, best known now for his Book of the Roach.